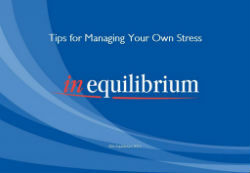 In Equilibrium’s handy booklet which provides some background information into what stress is; how to recognise its signs; the effect it can have on you and your body together with a hints and tips section to help you become more resilient. A recent study showed that trust is the no.1 driver of employee engagement. Another that even the smallest shift in wellbeing has an outsized impact on performance. This summary report by Working Families and Susanne Jacobs looks at the 8 basic drivers of trust and gives practical suggestions for the actions managers can take to improve the process of creating trust; engaging and enhancing wellbeing for employees; and to produce sustainable high performance for the business.